Energy saving light bulbs – are they bad for you? Here at StopGap, we are interested in all things energy saving, not just sealing draughty floors. So when we received a comment on our Facebook page about energy saving light bulbs, I had to learn more about them in order to respond. The Facebook post that received the comment was an image supplied to us by Energy Saving Trust as part of Big Energy Saving Week last year. I hadn’t really considered the image at all until we received a comment on it – that we should be recommending LED bulbs rather than the type illustrated in the image, which according to the commenter, contain mercury and are bad for health and the environment. I immediately set about finding out more, and I am here to share that with you. Over the last few years, traditional incandescent bulbs have been steadily phased out in the European Union, America, Brazil and many other countries. First invented around two centuries ago, the incandescent bulb has been in use in homes and businesses all over the world. It has many advantages such as being cheap to produce, compatible with dimming and strobe lights, not containing toxic materials, and having a Colour Rendering Index (CRI) of 100 (The CRI of a light source is a measure of how faithfully it reveals the colours of objects compared to a natural light source, 100 being the most faithful). Unfortunately, there are disadvantages too, with these light bulbs only managing to convert around 10% or less of the energy they use into light, and this is the reason for their demise. Halogen bulbs are a type of incandescent bulb that are slightly more energy efficient but are nothing like as good as modern energy saving bulbs. Compact Fluorescent Lamps have become a common replacement for incandescent bulbs, and it is this type of bulb which featured in the image on our Facebook page. They have a distinctive appearance – a small fluorescent tube which has been adapted to fit into normal lamps and fittings by being twisted into a spiral or loops. It works in the same way as long strip light fluorescent tubes. The tube contains mercury vapour, which when a current is passed through it, becomes excited and emits ultraviolet light. This ultraviolet light then hits a coating of phosphor on the inside of the tube, causing it to light up. Although early versions of these bulbs took a while to light up and gave poor quality light when they did, modern bulbs are much better and have become commonplace in homes around the world. There are some downsides to these bulbs though, and one which was brought to our attention is the presence of mercury. In trying to get to the facts on this, I have read web pages from a lot of sources from the BBC to bulb manufacturers to environment bloggers. It actually seems that the risk to health from each bulb is low if it is disposed of carefully, as the amount of mercury present is tiny. The official advice from the Department of the Environment is to vacate the room for at least 15 minutes before cleaning up the bulb, and to wear rubber gloves whilst putting it in a sealed bag. Be careful not to inhale the dust but don’t use a vacuum cleaner. It can then be taken to your local council waste disposal depot. To put it in perspective, apparently the amount of mercury released by breaking one CFL bulb is around the same as there is in only 13 tins of tuna (3 or 4 month’s worth if you eat it a few times a week). As this stuff builds up in our systems, maybe it’s worth giving up tuna instead of low energy light bulbs. There are other health concerns that have been raised, with links to migraine, eye and skin problems possibly related to the uv light or radio frequency radiation given off by CFLs (although they only emit very low levels of uv). There doesn’t seem to be a lot of scientific evidence to support this but it would probably be worth removing CFL light bulbs from lamps that are close to seating areas such as reading lamps, for those who are concerned or who notice a sensitivity. Of course, the less mercury that is released into the environment the better. Once it gets into a water system, it is absorbed by micro-organisms, which then convert it into methylmercury. This more harmful form then builds up in the creatures further up the food chain, including humans. There’s a great article going into more detail on this at sciencedaily.com. First appearing in the 1960s, It’s only recently that LED bulbs have been able to be made bright enough for general use. For lamps, most need multiple LEDs to provide adequate lighting. So are there any health risks associated with LED bulbs? There are some concerns over high intensity white or blue toned lights, as they can cause eye damage, but this is not specific to LEDs, it is true of any kind of light. And similarly, the effect of blue light at night on melatonin production is not limited to LEDs. Melatonin is a hormone that regulates sleep and wake cycles. The health risks linked to the disruption of these is becoming more widely known. 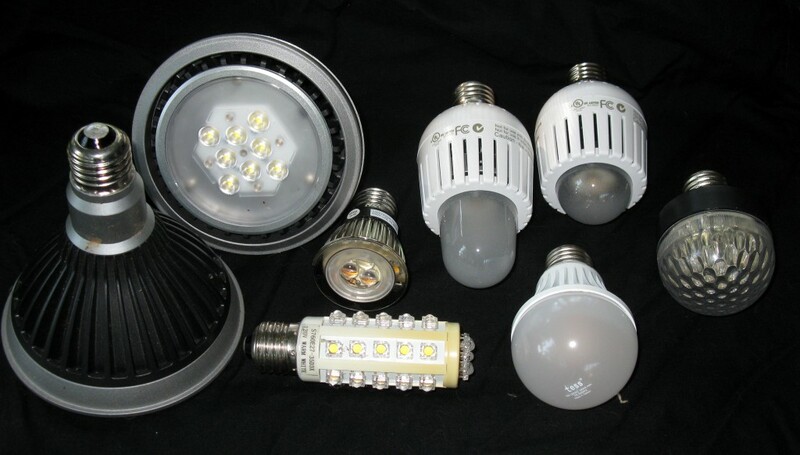 In terms of any negative effects on the environment caused by LED bulbs, although they do contain some toxic substances such as lead, arsenic and nickel, they are not currently considered a threat and are disposed of in normal landfill waste. Researchers at MIT have shown that by surrounding the filament with a special crystal structure in the glass they can bounce back the energy which is usually lost in heat, while still allowing the light through.They refer to the technique as ‘recycling light’ because the energy which would usually escape into the air is redirected back to the filament where it can create new light.